So the truck saga continues. Mom got a call that put our whole world in a downward spiral. As it turns out the rear end of the truck will need to be replaced. If our live was simple that would mean the mechanic would go to the part store and pick up what he needed install it and we would be fine and dandy. You all do know that there is nothing ever that easy around here. First, the mechanic is trying to fit our truck in as he is full of appointments. He is one man and he owns one lift. He is doing us good by at least trying to fit us in. Second, Mom’s truck is a 2000 Ford Pick up with a heavy duty rear end that is still all factory parts except the work she just had done on it, the brakes, spark plugs and filters. That means the parts will have to come from a salvage and they will not be easy to find. Did I mention that the mechanic is busy up to his eyeballs? So Mom decides she will make the calls to locate the parts. After all we need the truck to get to Dallas right?? So call after call … no one has the right rear end. Finally, Mom finds one that can order it and it might come Thursday but it might not get here until Friday. Mom places the order and is praying. In the mean time she decides that if her truck isn’t going to be ready she needs to find another way to get me to Dallas. She has a brilliant plan. She will rent one. Have you ever tried to rent a truck to actually haul something somewhere. Well, You have two options really. The first is a rental car company. However, buyer beware. In the contract of renting a truck it says you are not allowed to haul anything with it. They don’t even have balls or hitches on their trucks. REALLY??? Yup … Mom tried. Then she called U-Haul. They have to have trucks that can haul things. Yup they have them but they are set up to service one way moves. And according to the guy on the other end of the phone we would have to re rent the truck in Dallas to get to use it to get home and the mileage would be about a 1000 bucks for a trip that long. We can’t afford that. Okay, that bombed. Who do we know that we can borrow a truck from?? The answer is no one. All of our friends are working class people. Most would gladly allow us to use their truck if we had a vehicle that they could use to get them to and from work while we had it. Well, it we had out truck we wouldn’t need theirs. So that brings us to another issue of insurance. Mom’s insurance will cover her using a rental car to make the trip since our truck is broke down but it will not cover a vehicle owned by an individual. Yup we are in a bind! Mom is worried. So much so that she called to find out what it would cost for me to draw out. Well, the answer is everything. I can’t even get my stall fees back if I don’t show. Everything we have paid for will be lost if I don’t show up. 500 bucks! And that doesn’t include my hotel and gas but I wouldn’t be out that if I didn’t go. Mom even swallowed her pride and called her adoptive Mom who gave her a lecture on how I will just have to ride with someone else that is going. As if I hadn’t tried that already. It is hard to get a ride with people when you are one of like 10 kids in the Whole State Going. There is a girl I know that is going but when I called her she said her trailer was full. There is a whole other story their that I wouldn’t get into here, but I did try. Anyway, Late tonight another option presented itself to me. I pitched the option to Mom and she, being herself, shoot right back at me “At what cost”. She then pointed out that this other option would cost the others involved a high price … one that she doesn’t feel is right for us to ask them to pay. She also pointed out that there would never be away to repay them that cost. And she didn’t fail to mention that this other option might make other a bit on edge. We don’t travel like, dare I say, “normal” people do. Our travel practices sometimes make others nervous. By that I mean Mom is a minister with blue hair. She is right at home in some pretty colorful parts of town. As a matter of fact when we travel we often find ourselves in Hotels that have other people remarking “You stayed THERE?” Mom is a military brat that has learned to fit in just about anywhere and she expects me to do the same. She doesn’t want me seeing poor or rich as any different. I have seen my Mom in terrible neighborhoods and I have seen her in fancy attire dressed to the nines. Either way she is as natural as can be. The sad truth is that since Mom no longer works the lower end of things often fits our budget so that is how we travel. We even take a cooler and don’t eat out while on the road. The option that presented its self may include others that are not accustomed to this kind of travel and Mom doesn’t want to have to bare the burden of them being uncomfortable the entire trip. I understand Mom’s worries. In the end she said she would Pray on it. Honestly, I don’t know what is going to happen. So the last few days have had me asking Really?? I can’t believe my luck these days. I have heard the phrase If I had any luck at all it would be bad luck … Well, I don’t need any help with my luck. I have to say Mom has a way of looking at things that I know amazes most people but sometimes it even amazes me. Okay, Really? How did she get that out of everything that has happened over the weekend?? I know that God plays a part in everything we do, but really?? He had his hand in all that??? Mom has always told me that God spends more time fixing and making the best of either our own doings or the Devil’s work. And I agree with her for the most part. However, Even with everything that has happened Mom will not allow anyone to take time to have a pity party. And honestly, that really is what I want to do. I want to be poor me!!! In the last two weeks I have lost a Dog, been left of the roadside with my horse trying to get to a rodeo so I didn’t lose my money, I have broke out leaving me with no paycheck and then Saturday night I had it roped to win it until I fell off my horse. Yesterday, I had planned to go to another rodeo but we have had a private farm visit scheduled for over a month and that meant I had to miss my Rodeo all together. I know that Mom has had her issues too. Look at the truck. She took it in and had it worked on and did a bunch of service work just because the truck was getting older and it really needed the work. Then it broke down anyway. I know she is trying to make ends meet so that I can go on my trips in October too. She has stuff she is trying to get in the Etsy shop but every time we start to post things … Something gets in the way. I know Mom is stressed. And little things are still happening but Mom keeps smiling and saying Oh well, it will be fine. Like tonight, Mom took me to a friend’s house to rope. We had a lot of fun and for the time being it helped me forget the world. Today Mom cooked two packages of steaks in the crock pot and she was looking forward to eating some when we got home. When we got home we found that Dad had eaten all but enough for me. Mom, after she had cooked them and made gravy for them and everything … Got only about 3 bites that I saved for her. She wouldn’t eat until I had eaten most of dinner and then she made herself a cheap processed dry chicken patty and ate that. Mom didn’t even get Mad she just said “Oh well, Dad must have not realized we hadn’t eaten yet.” She then took time to put more steaks in the crock pot saying that maybe she will get some tomorrow. It just seems like everything is being dished out at us. From serious to not so serious. Honestly, I have had enough. I want all the bad to stop for just a bit or at least even out with something good for a bit. Would that be to much to ask???? I pulled into the driveway around 5:00pm this evening. The air was still and quiet as I scanned the pasture for Holly, Sweetie and Van. I spotted Sweetie and Van but Holly was nowhere in sight. I knew that if those two were in the pasture Holly wasn’t to far away. I made my way quickly to the front door and headed inside. The stuffy heat hit me in the face and I broke out in a sweat instantly. I had been in such a hurry to get out the door this morning that I hadn’t taken time to turn on the fans or A/C. It was the cool of the morning when I left so the thought never really crossed my mind. I dropped my purse in the mess on the desk that I had intended to get cleared off today and made me way to the restroom. From there I headed through the house to turn on all the fans and A/C units. Moose and Rascal had been inside all day and I was worried that they needed fresh moving air. As I passed through the kitchen the signs that I had just left unexpectedly were everywhere. The Carder was on the table with fiber laying around. A half drank cup of coffee sat on the counter starting to show the ring left by coffee sitting in it all day. The shoes at the back door were just waiting for me to go milk. Everything sat there as if stopped in time. I got to RJ’s room where Rascal was still locked inside. I didn’t take time to locate him. I took notice of the used cat pan while turning on the A/C, starting the load of laundry to rewashing that had been left to sour in the washer and headed to the Kitchen door. Moose was excited to get outside and relieve himself even though he had already had an accident on the floor. I scooped him up and took him inside the minute he was done with his business before heading to the barn. I had only three chores that I needed to get done this morning when I had gotten the call and they were still not done. Both chicken coops stood with their doors closed and the birds inside longing to get out. Normally this isn’t an issue with chickens but when you free range that means there is no water and no feed in those coops. I stopped only long enough at the first coop to let the birds out. I still had the calf with the bad leg to get up and since I had been gone all day He had been over 12 hours with no one tending to him. I knew he would need to be stood up and watered so that is where I was headed. I got to him after I passed the second coop where I took time to open that one too. Mister Calf was very unhappy and laying on his side. It took a bit of doing but I got him to his feet. He was stiff and needed to let everything settle into place as he had been on his side longer then I like to let him lay. With the chickens and the calf tended to I grabbed Sweetie and headed to the big barn to check the other two cats and get her milked. We have started drying her out so I only take half the milk she has in her bag. 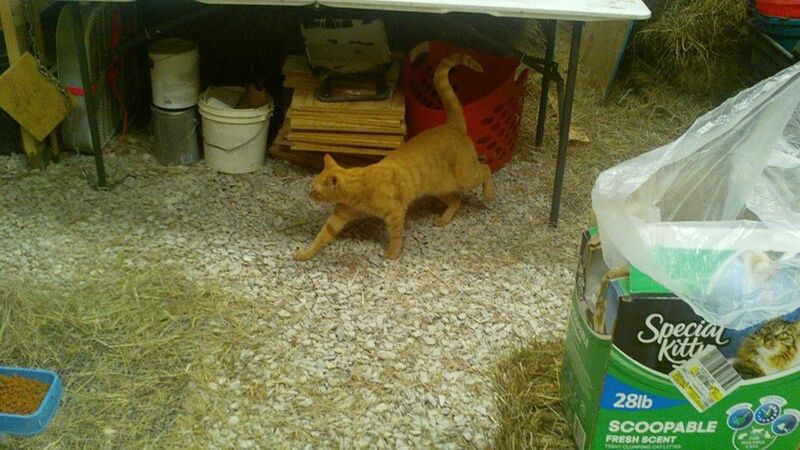 I searched for Peanut and Morris in the barn but only found Morris before heading to the house to get the milk put up. It was after 6:00pm when I filtered the morning’s milk and set it in back of the row in the frig. It was only then I stopped to breathe! It is at this point I realized just how Blessed I was. The days events could have been so much worse but by the Grace of God Everything went perfect. As relaxation set in so did the grief and worries of the day … It had started early as the guys had left to go to a roping some 3 1/2 hours away. I made a pot of coffee, did the dishes and set out to finish up the batts I started the day before. I had plans to make soap and clean off the desk, put away all the laundry, wash fleece and work on getting material organized for bag making. If there was time I had plans to work on cleaning off my work table in the fiber room as well, that way I could leave my sewing machine set up all the time. As I carded the second batt I got a call. The truck was broke down and smoking on the side of the road. RJ was calling everyone he knew that was going to the roping, trying to find a ride to pick him up. Normally this wouldn’t be a big deal either, except that for the first time RJ had collected enough Faith and confidence to enter a roping that required a deposit. Over a month ago RJ had sent in half the roping fees to this roping and if he didn’t show he would lose his money. Lee was on the phone to me letting me know what was going on so that I could start working a plan to get everything home and to the mechanic. I had just got the truck back from the mechanic Thursday so we had no idea what we were dealing with. As RJ found a ride to the roping, I started to think about what was happening. I was about to let my 17 year old son go to his first roping alone with no parent and with the hands of an acquaintance at the wheel. To some this might not be a big deal but to me it is a HUGE Deal. I have lived the nightmare of a roping accident with RJ’s Dad before. The ambulance ride, the call from the hospital, 4 hours of major surgery to put him back together … Not to mention the 3 days in ICU! Oh Yeah, this was a HUGE HUGE deal. Once we got all three of the trucks in the same spot things got better. We loaded my truck on the goose neck trailer while Lee hooked the horse trailer to my Father in law’s pick up. My friend taught me how to chain a truck to a trailer and then everyone Hit the road. Lee and my Father in law set out to collect my Son and his horse from the roping. Which sadly, RJ didn’t draw a paycheck from. I talked to RJ on the phone while my friend and I drove the truck home. He finished roping about an hour before his Dad reached him. At this point in the day, RJ felt responsible for everything that happened. He said that if he had just stayed home none of this would have happened and he would only be out half his money. I was quick to point out that it is better that it happened here then on our way to Dallas in a few weeks. He agreed and seem to get a better perspective on the matter. My friend and I talked about his days growing up in Illinois, how things had changed and places he and his wife plan to take their son someday. We talked about his senior Trip to New York and how when we were kids we didn’t appreciate the traveling we did and all the places we saw … and how if we could do it over at the age we are now we would take time to appreciate it. We stopped at McDonald’s and picked up a bite to eat and we made our way home. We dropped the trailer at the mechanic’s and then my Friend took me to my car and he headed home to his wife and son. As I made my way to house the guys called and said they were going to stop off at yet another roping on the way home. Had they not had enough of this day already??? As for me, I got my chores done and got me a tall, cold Pepsi and sat to write this post. Would it be to much at this point to ask that anyone with extra Prayers, Mojo or Good vibes to send them our way??? Okay that isn’t really a trip but it was the first stop to pick up a few supplies that I needed. Cat Food and Cat Litter. You see … Mom and I both saw the same news cast online. That hardly ever happens. This time however, it did. It was about a shelter that was 100 animals over it’s limit. They are having a rough time and they had tried everything. They even had animals on sale. Dogs were $50.00 and that included spay/nueter, vacinations and worming. Cats were $10.00 buy one get one free. Now I couldn’t bring myself to even think about another dog. As a matter of fact I am not sure I will ever get another dog. Anyway, I asked Mom if we could go look. She said that she thought we could get two cats to live in the new barn and take care of the mice out there. So Off we went. There were so many that needed homes. It was saddening. To make a long story short. We now are adding 4 cats to our mix. First there is Dougie. Mom changed his name to Morris real quick. Morris is a large neutered, orange Male Tabby. He is more lover then anything. He is an explorer and had explored the entire barn in less then an hour. He has crawled in and out of hiding spots in the hay and visited all the stalls. He doesn’t stay still for long that is why there are no good pictures of him. Then there is Peanut. A long haired calico colored thing. Peanut is not so friendly. 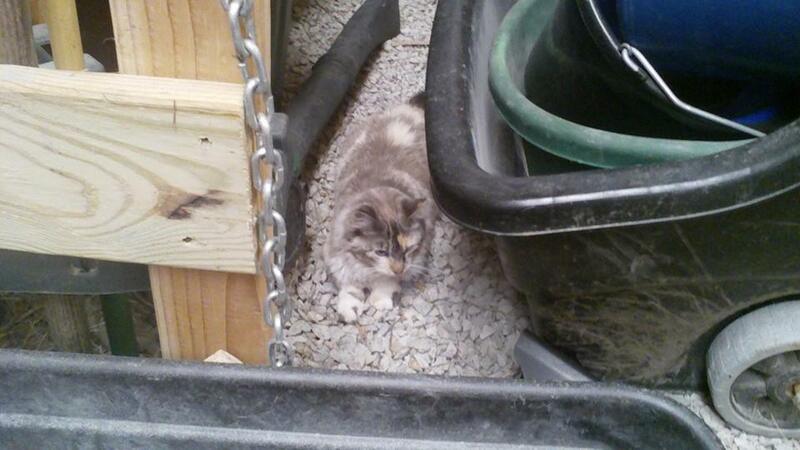 She is a hissy cat and wasted no time finding the mouse smell in the feed stall. She has stayed in that stall since she came home but wants no human contact as of yet. She too is a large, Spayed Cat. To be honest she is also really pretty. Mom says she will come around when she starts to feel safe. She hasn’t used her claws on anyone or anything but she hisses … ALOT! Then There was one cat that I just wanted … I don’t know why. He is huge and I haven’t really been able to get a picture of him at all. He is named Rascal. He is what Mom calls a Tuxedo Cat. He is huge and Black and White. Let me tell you Not only is this cat a hissy cat … He demolished the cardboard carrier they put him in for us to bring him home. He has claws and he knows how to use them. He warns you once and that is it. I have Rascal in my Room. He and I have agreed to co-exist in my room. He was so scared in that shelter … I know that with time and a quiet surrounding he will come around. I bet that at some point I will wake up to him and I sleeping together in Peace. On the way home as I fought to keep the big guy in the carrier Mom told me a story about a cat she had when she was a kid. His name was Coacoa. He was beautiful to her but he was so scared that he was only friendly and at peace in her room. Her parents however, didn’t like the fact that he had to be seperated from their other cats. They said that if he couldn’t get along he had to go. And they made her get rid of Coacoa. After that I knew Mom was on our side. If I wanted this mean old cat he would be mine. Even if he never leaves my room … I knew Mom understood that there was just something about him. I will try to get a picture or two of him when he learns to relax but for now he is my little Rascal. There is also Welsey that is coming home next week. She is a big grey and white cat but she isn’t fixed yet. She will be spayed Wednesday and I think she is coming home Thursday. Either that or she is spayed Thursday and comes home Friday … I didn’t pay much attention as she is Mom’s cat. Today I was late getting things done because I had to take one of the large calves to the sale. It is amazing how one thing can set the day off. It wasn’t a bad thing to be off schedule but once I got off it felt like everything went haywire. After I got home from Dropping off the calf, I tried to practice like every morning. However, it was all just off. I did learn another lesson though. You see I was rinsing off Ice after our roping and I dropped the hose by his feet like I have a ton of times before. Then I went to go turn off the water. When I did the hose flipped over and sprayed Ice. Ice’s attention was on other things and the water hose ended up scaring him. I reacted and yelled at him and pulled on his halter to get control of him again. Mom was out in the pen with her Buddy feeding the chickens and she got mad … At ME! What did I do I asked through gritted teeth. Mom told me that I reacted horrible to Ice. I told her he was running me over. (okay at this point my tone sucked … Just sayin’) Mom got that did you just talk to me like that look on her face and I knew I was about to get a slice of humble pie. And I did. I see what Mom is saying but how do you not react to something you see as a threat even if you caused it?? I didn’t think about why he was spooking at the time I just got on to him and made him give control back to me. I didn’t stop to think about anything because in those moments I don’t know how to make my self NOT just REACT. If anyone has any ideas I would love to hear them. After my morning mishap I spent some time roping the dumbie and thinking. After lunch we went and got the Truck … 500 bucks later and the Truck is home and sound once again. When we got home from that Mom and I started mowing another section of the lawn. Mom also helped her buddy unload the last of the show stuff from the trailer and put it up. When Dad got home I told Dad what happened. Then I asked him what he would have done. He looked at me and said he would have done the same thing and told me I handled it just fine. Then Mom asked Dad the same question she asked me only she said it about me when I was little. Dad said that he wouldn’t punish me as it would have been his fault. Mom then asked why he felt that me punishing my horse for something I did was acceptable if he wouldn’t punish me for something he did. Dad just stood there looking at Mom. You could see his wheels in his head turning … Then calmly he said I wouldn’t but then again your son doesn’t weigh about a 1000 pounds either. Mom just looked at Dad and said that Size was neither the point or the issue. She then told Dad that our actions were the issue and that just because the horse is bigger then I am doesn’t make it right. Dad just shook his head and walked away. We both knew he lost that arguement … LOL In the end I see what Mom is saying but I really don’t know how to change it. I just reacted. Today was another day with a bit of this and that going on. We are now closed until Nov. 1st except by appointment. This is the month to get things done before winter sets in and with Fall in the air, breeding is on everyone’s mind. The day did start off like normal. There was one little difference though. Since I got word that Precious got a clean coggins test I have been letting her out on the pasture and only bringing her in to eat. She came up with Coop this morning and she is catching on fast that the feeding goes on out at the barn. She is learning to come up in the morning and get fed. That is a good thing. After I fed everything, I was in the roping pen for awhile. After that I helped out a round the house a bit. I helped Mom get some more mowing done and Mom worked on Fiber stuff so that she can get things cleared out of the fiber room. She is down to her last Merino share to wash and she has part of it spun up already … Ms. Diane will be happy about that. Mom also is working to finish skirting and washing some other fibers but that is another story. Anyway, Mom got another call about the Truck and with each call the cost seems to go up and up … Mom just keeps telling me it will be fine and that we will handle everything that is coming our way by the Grace of God. This after noon we had a few things to drop off in town for the season’s end at the farmer’s market, before heading out to see Storm. She is doing great. The trainer is now riding her. He says that these last few days things have started to click with her. She is figuring out what he wants and giving it to him. Mom took a bit of Video and as soon as I can I will get it posted. On the way home we stopped and picked up part of our weekly feed order. We were in the car so we couldn’t get the whole order. I got my two new strings while we were there and then Mom and I stopped to enjoy a half price ice cream cone sale at Sonic. It was alot of fun for a buck!! When we got home Mom and I worked to finish the section of lawn she wanted done today. Since the yard was a bit long due to having the mower in the shop it is slow going and we are doing a section at a time. Anyway, When Dad got home Mom made him clean up a bit of stuff he had left laying around that she was finding in the tall grass. Then the feed got unloaded and Dinner got made and chores got done. So today was interesting. Just like every morning I roped first thing. From there a lot of things happened so I will try to put them all out there and I hope I don’t miss anything. I got a call from the Vet and Precious is in the clear. That means no more quarantine. That also means Pasture time … The first thing we did was turn her out. She is on the pasture and had more grass then she will ever eat. It was kind of different to see her out there and she didn’t want to move. You see when she was in her old pasture if she found grass she had to stay and eat it all or she would lose it to another horse. Our pasture is all grass and it is taking a bit for it to sink in that she can move around and as of yet hasn’t run at all. Mom did get her to a trot but no out right running. After that Mom got a call and her truck had more issues than just the breaks. As it turns out she will need about $200.00 more work done then we thought. The mechanic called and said it was unsafe to drive and there is no way it would be making the trip to Dallas without the work. That is not good news but at least we can get the work done before the trip. We also moved Mom’s big cactus. I know that isn’t really news but have you ever had to move a huge cactus that hangs over the edge of the pot??? It is a real accomplishment when you get it done … I well you … and we did it with Minimal pokeage … Is pokeage a word??? LOL Anyway, it is now not by our front door and won’t be able to get anyone anymore. Another thing we did was move some of the sheep around. Reba joined the Merinos while the young not going to be bred joined the pasture. I still have two wethers, a ram and a ewe to sell so that will happen in the next few weeks so that when we get back from Dallas we can get the sheep divided into their breeding pens again. After that I helped Mom get the soap samples ready for the end of the year farmers market. They will be given away to everyone that attends. I had to call Harry and have him bring out a bag of feed for me today too. When he brought it out he helped use sack the samples up …. LOL. Well, other then mowing the yard I think that is aobut it. If I forgot anything I will let you know tomorrow. LOL OH WAIT … the Podcast is late. Mom says she is going to make it work tomorrow. We are having technical difficulties with the software we use to edit it so Mom is screaming mad at it ….